A bug has been found in the latest version of the component NeoRecruit. It is a problem existing in sending notification emails to the candidates, when the status of an application is updated from the back-office. 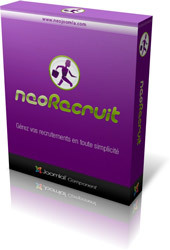 This bug is now corrected with the new version 4.0.1 of the component NeoRecruit, only for Joomla 3. No specific operation is necessary to upgrade the component, you just have to install this new release from your extensions manager, in the back-office of your Joomla! website. If you want more details about the component NeoRecruit, you can consult the detailed extension card. Instead of just adapting the previous version of the component to simply make it functional both under Joomla 2.5 and Joomla 3 (with the risk of having some compatibility problems, and being forced to restrict some features), the component has been all rewritten for Joomla 3, which now allows NeoRecruit to benefit from the potential of the latests versions of the CMS. This gives some new features to the component, such as : (read more). If you want more details about this new version, you can view the complete lists of changes.